Memory foam is giving the mattress and pillow industries a very nice makeover. From the usual hassle of having to endlessly look for the right shape and the comfort zone, one can now rely on the foam’s ability to contour itself to the sleeper’s body for a really personalized comfort and support. This is actually a very significant development as this material was previously accessible only to a very few people. From something that was reserved for the elite few, this material now makes up the majority of the mattresses and pillows found in almost every home. 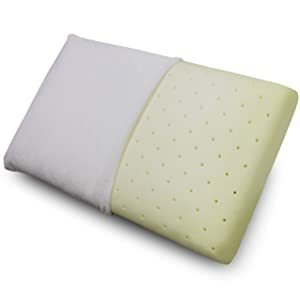 One such product that has been proven to provide all the benefits of a memory foam product is the Classic Brands Conforma Memory Foam Pillow. This is a pillow that features the classic advantages of memory foams, plus more as it includes several new technologies that are all geared towards achieving that desired restful slumber. It has a soft velour cover, which is also removable and washable. Resistant to allergens and dust mites. Offers a cooling technology, which is supposed to give a cool and comfortable sleep. Caters to all kinds of sleepers. Encourages the right positions when sleeping. Quickly contours to the shape of the user and maintains that shape throughout the night. While other memory foam pillow employs a technology that solely keeps the product warm, the Classic Brands Conforma Memory Foam Pillow makes the temperature normal. It gathers heat when it gets cold and dissipates it when the right condition calls for some coolness. Regardless of the condition, its ability to regulate temperature allows the sleeper to rest comfortably all through the night. A feature that is often underappreciated but very much needed by a pillow. There are other pillow materials that are the ideal resting places for dust mites to populate and play host to a multitude of substances that cause allergies. These things are effectively eliminated by most memory foams and especially with this one. No allergies and dust mites mean yet again a very comfortable sleep for the user. The memory foam’s ability to contour itself to the natural shape of the sleeper encourages the right sleeping positions. As the right sleeping positions are encouraged, the sleeper also gets to sleep with all the right comforts and support. The correct positions can reduce pressure points and make the user well-rested. Contrary to what some people might think, a memory foam can also give that plush feeling. This is one of those pillows that deliver that unique feeling of plush comfort and the right support. The design and material of the pillow embrace the sleeper in a very comfortable and supportive feel for a truly restful slumber. The Classic Brands Conforma Memory Foam Pillow can be ideal for any kind of sleeper. Anyone who prefers sleeping on his or her back, stomach, or sides can find comfort and support in this very versatile memory foam pillow. The versatility stems from the memory foam’s ability to mold itself to the sleepers’ shapes. The pillow clearly points out in its packaging that it has passed the standard tests in the industry. However, there are those who would rather see the CertiPUR stamp of approval on this product. There are definitely those who are very hesitant to use or recommend the product without this seal of approval. The distinct smell from memory foams is also present in this pillow, but is something that can be easily eliminated. Airing out the pillow for a couple of days or Lysol application will do the trick. Trepidation aside from the lack of CertiPUR approval, this pillow is every bit as good as promised by the manufacturer. This is certainly a great pillow, particularly for those who can make do with the standard seal of approval.